Cleomes are relatively care-free, once they become established in your garden. They are hardy flowering plants filled with stunning clusters of spider-like blooms atop tall erect stems. Cleomes come in several varieties with each decked out in pink, white, purple or red flowers. Some varieties can reach a height of 5 to 6 feet and carry thorns and others have no thorns and are only 12 to 18 inches tall. Whichever variety you choose to plant, they are easy to maintain and are sure to catch everyone’s eye. Transplant your cleome plants or seeds directly into the ground after all signs of frost have passed. A sudden freeze will kill the young, tender plants. Select an area to plant your cleome that receives six hours of full sun per day. Growing your cleome in a shady location will cut down on the blooms and will make the tall plants droop over. Amend the soil to make it richer. Work manure or peat into the existing soil. Though they are tolerant of a wide range of soil conditions, they will do best growing in fertile soil that drains well. Water the soil regularly to keep it moist. This is especially true if the weather is hot. Once established, cleome plants are relatively drought tolerant. Fertilize your plants every six weeks with a slow-release fertilizer. Using a fertilizer with a high middle number will help the cleome produce new blooms. You can also use a water soluble fertilizer sprayed directly on the plant’s foliage, once every other week. Prune the spent flowers so the plant will send out another bloom. If you want the plant to make seeds, do not cut off the flower but instead allow it to completely dry on the stem. Once dead, you will notice the flower head is filled with tiny black seeds. 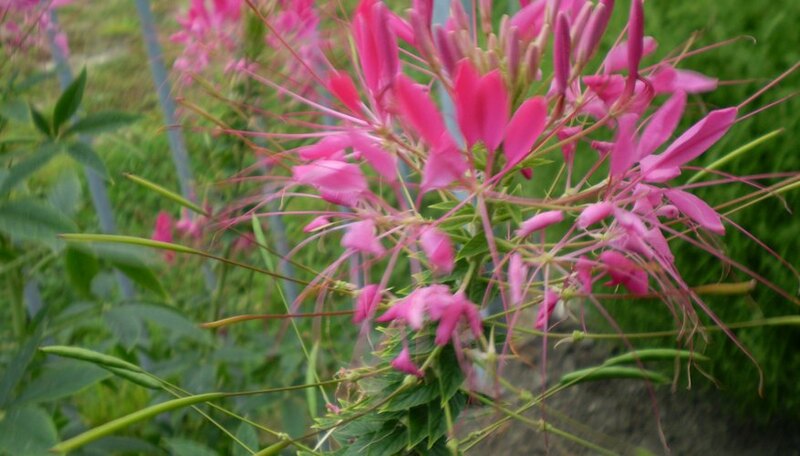 Stake your cleome plants if you are planting a variety that produces tall stems. This will help them stand up if the plant becomes too tall. Shorter varieties will not need to be staked. To ensure you have a continuous supply of blooming cleome plants, place new ones in the garden at the end of summer. Cleome plants will continue blooming right up until it the first frost. Pests are generally not a problem. If you do notice your plants becoming infested with aphids or other insects, use an insecticide that is designed specifically for cleome plants and that specific insect. Cleome can be grown in containers as long as they are situated in an area where they will receive enough sunlight each day. Cleome is also known as the "spider flower."